The homestead documentation for Henry Jackson. Jackson, an African American raised by a white family, homesteaded 40 acres on both sides of Long Lake in Oviedo, Florida. The area became a predominantly black settlement, now known as Jackson Heights. For 25 years he worked for Oliver P. Swope and N. F. Lezette clearing land. Original homestead document: Private Collection of Kathy Parry. Digital reproduction of original homestead document. Copyright to this resource is held Kathy Parry and is provided here by RICHES of Central Florida for educational purposes only. "Oviedo Historical Trail." Oviedo Historical Trail. http://www.reocities.com/yosemite/rapids/8428/hikeplans/oviedo/planoviedo.html. 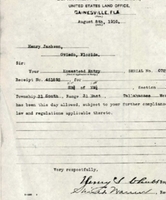 “Homestead Documentation for Henry Jackson.” RICHES of Central Florida accessed April 18, 2019, https://richesmi.cah.ucf.edu/omeka/items/show/5421.